November 2012 Visa Bulletin - A Gentle Reminder - Gateway to Canada | Canada Immigration Consultancy! Last month, we have sent you a checklist to get ready for the new Federal Skilled Worker program, which will be opened early 2013. You still have time to prepare but we wish to remind you that the clock is ticking. YOU MUST GET READY. For the year 2013, Citizenship and Immigration Canada targets to admit a total of 240,000 to 265,000 new permanent residents. From this target, 55,300 is expected to be processed under the Federal Skilled Worker program. Canada is still open for immigrants, you really just have to be ready. According to this twitter message fo Jason Kenney, Canada's Immigration Minister, the final procedures and guidelines for FSW program will be announced in the first half of 2013. At the Annual Conference of the Canadian Network of National Association of Regulators, the Immigration Minister talked about the new Federal Skilled Worker program, among other immigration concerns. You can read the Speaking notes for The Honourable Jason Kenney, P.C., M.P. Minister of Citizenship, Immigration and Multiculturalism here. The new FSW program will be using the Expression of Interest System. If not in 2013, this could be implemented by 2014. This is somehow similar to the immigration system used by Australia and New Zealand, where they prioritize highly qualified applicants and is not based on who filed the application first. But of course, it would still be best if you will be able to file your application immediately once the program opens. The system will allow us to more actively match the best qualified applicants with employers and the jobs that are available, rather than just taking those who are first in line and dropping them into the general labour market to sink or swim, in which case too many are struggling to keep their head above waters in the current system. So our new system – it will eventually be called the Expression of Interest System for Skilled Workers – would essentially be a pool of applicants who are prequalified. They’ve done a mandatory third-party assessed language test, which is a relative new feature of our system, if you can believe it. They’ll have done the educational assessment. They will, based on the new points grid, be typically younger with higher levels of language proficiency. And they will be going into this pool of pre-qualified applicants. We are working with employers, sectors and provinces to figure out how to give employers limited access to that pool of applicants – of course, respecting people’s privacy rights – so that they can identify people who are ready and willing to come to Canada, and who are pre-qualified. They will offer them jobs after they’ve done their due diligence and are satisfied that they can work at their skill level. And then we will bring those people into Canada within a matter of months." In New Zealand's Expression of Interest system, the priority are those who get higher scores/points. The same could be used in Canada's new FSW program. Thus, you must maximize every factors where you may get additional points. The higher the points, the better your chance will be. Do not content yourself by just meeting the 67 points passmark. If you are married, I strongly suggest that you and your spouse both take the IELTS examination. It may mean additional cost, but it will definitely be to your advantage. But she did not give up. 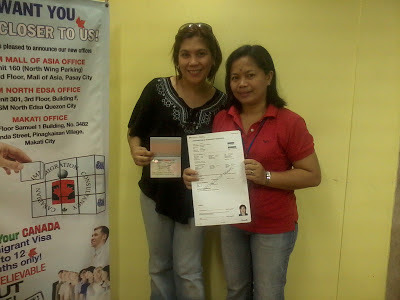 We filed her application again on July 2011. This time, she was able to make it to the cap. She was required to undergo medical examination on December 2011 and her visa was issued April 2012. By now, you should have filled out and submitted the refund form required by Citizenship and Immigration Canada. All applications filed before February 27, 2008 and do not have have decision yet as of March 29, 2012 will be returned unprocessed. The visa processing fee will be refunded. This is as a result of the law passed to wipe out Citizenship and Immigration Canda's backlog. If you haven't filled out the refund form yet, please click here to download the form, fill it out and send to jweisdorf@gmail.com. If you still want to pursue your immigration plan, please contact your Agent and send your updated resume for assessment. There will be a new Federal Skilled Worker program to be implemented in 2013. This time, the processing period will be shorter. But the new program is ideal only for younger applicants. The ideal age is 21-35 years old but depending on your circumstances, even if you're 40 years old already. For those who are no longer eligible for Canada's immigration program, you may want to consider immigrating to New Zealand. If your age is between 21-55 years old (New Zealand) / 21-50 years old (Australia), with at least 6.5 IELTS General Training total band score and with at least 3 years work experience and related university/college diploma listed here: Australia and New Zealand Skilled Worker Migration Program | List of Eligible Occupations, then you have a chance to get a permanent residence in New Zealand.